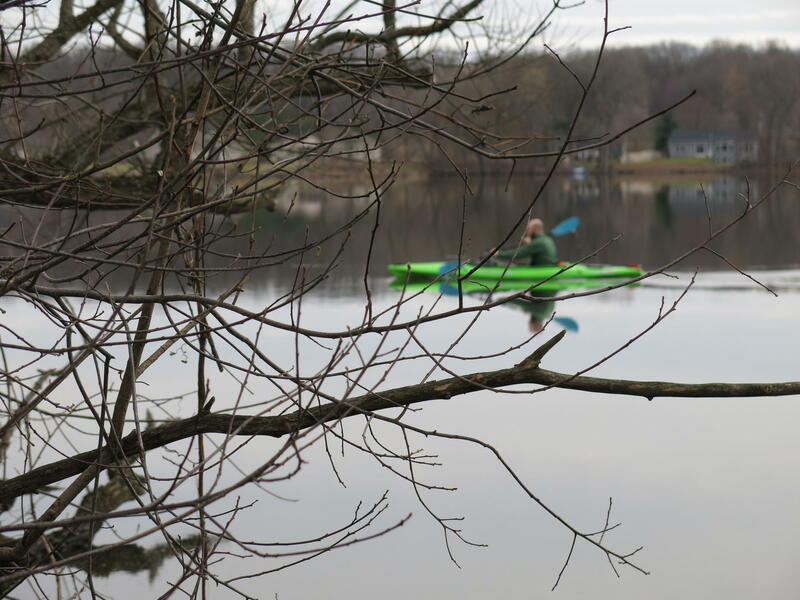 A kayaker on Morrow Lake in 2016. The lake was the stopping point for oil that spilled from a pipeline near Marshall in 2010. Through a massive oil spill and an equally massive cleanup, the Kalamazoo River has proven resilient. Scientists say it's done remarkably well since 2010, when it took more than 800,000 gallons of heavy crude from a ruptured pipeline near Marshall. But Michigan State University ecologist Stephen Hamilton says no one is doing much research on how the oil might affect wildlife in the long term. He says that’s a “missed opportunity” to understand what happens when tar sands oil ends up where it shouldn’t be. Hamilton will speak Wednesday at Western Michigan University’s Lee Honors College about how the Kalamazoo River has fared since the spill, the largest in the inland United States to date. It was the first time a large amount of Canadian tar sands crude was dumped into a waterway. At the Kellogg Biological Station in Hickory Corners, where he’s based, Hamilton told WMUK’s Sehvilla Mann that studies from other spills have indicated there’s reason to be concerned about the oil’s effects on wildlife. “The Exxon Valdez oil spill and now the Deepwater Horizon have shown lingering effects of exposure to oil that can last for years – surprisingly subtle though. And it took a lot of research to reveal these,” he says. Those spills happened in areas with economies that depended on healthy waters. “We’re just not seeing the same degree of attention, the same spotlight being put on the Kalamazoo River. It doesn’t mean that things aren’t happening,” he says. Below is a transcript of WMUK’s interview with Stephen Hamilton. Sehvilla Mann: Cleanup seems to me like it can be a misleading word. If I spill a glass of something on my counter, it’s cleaned up when I don’t see any of it anymore. But I understand, you’ve said, there’s still some oil in the river. You can’t get all of it out? Stephen Hamilton: Well that’s correct. And so any cleanup of a spill and especially an oil spill on a complex environment like this, you need to make the judgment of how far to go before the cleanup actually does more harm than leaving the oil in place. And so this was four long years of intensive cleanup in this event, and the recoverable oil was recovered, and then the EPA and the state Department of Environmental Quality made the judgment that they should not continue further cleanup because it would cause more harm than good. SM: What is it about the cleanup that can eventually cause harm if it goes too far? SH: Well in this case we’re thinking about this type of oil, which is from the Canadian oil sands region. In the US we often call it tar sands oil. And what we learned from this event, which was actually the first major spill of this kind of oil into a water body is that a substantial fraction sinks below the surface. And that greatly complicated the cleanup. Because you couldn’t see it, it moved with the water flow far and wide in the river system, found its final resting place wherever sediment settles out and that turned out to be particularly behind dams, but also in any little side cove or channel where the flow slows down. And so going after that oil was what made this take four years. The oil that was deposited on land – and the reason that happened at all was because the river was really high at the time – and the oil spread out with the water, and then the river went down in the weeks after the pipeline break and the oil coated the floodplain and the banks of the river – we call them riparian zones. And that was relatively easy to clean up only because you could see it and physically remove it. It was still a huge job. But that was largely done in the second year. And it was the, going after the submerged oil that took so long and was so complex. And that’s – the oil that remains, as far as we know is beneath the water surface at normal summer water levels. SM: Is it sort of evenly distributed throughout the river or would you hit pockets of it if you were going to look for it? SH: Right, it’s not evenly distributed, because it – what it does is it adheres to natural particles in the river when it goes underwater. And that’s actually the reason it goes underwater, as far as we understand it. And the river’s carrying those in suspension or perhaps they’re rolling along the bottom with the flow, and then as soon as the river slows down they tend to settle out. And there are areas with big dams that cause a lot of settling. The Ceresco Dam, which is removed now, retained quite a lot of that material. And then Morrow Lake and the Morrow Dam – that’s as far as the oil got – it turned out to be a very large trap for submerged oil. It was also happening on a smaller scale all up and down the river in small pockets. But in terms of the quantity of oil, the cleanup efforts for submerged oil were focused by – on those two dams and to some extent in the Battle Creek area where there’s some dams that make what they call the millponds. SM: There was about 800,000 gallons of crude oil spilled into the river. Do you know how much came out in the cleanup? SH: The best guess is that roughly about 80 percent of the oil that spilled was recovered in one form or another, either on land or skimmed off the surface or recovered through dredging. And maybe about 20 percent remains in the river system. Now that sounds like a lot. And it is a lot in terms of gallons, or barrels if you express it that way. But it’s spread far and wide in the river system and so the actual concentrations of oil in the sediments are quite low, actually difficult to measure. SM: Six years is a while after the spill, but is it long enough to say what the effect is of having those little oil blobs scattered around in the river? SH: It’s getting long enough if there were research dedicated to looking at that. But we actually don’t have a lot of research looking at that to my knowledge, so – we don’t have the resources dedicated to looking at that question in the Kalamazoo River. SM: Is this something where you can look at other oil spills and say, ‘we think it’s going to have this kind of effect on the river ecology’? SH: We talked about that a lot with the National Academy panel because we didn’t want to have just one case study. But the Kalamazoo is the big case study for this kind of oil. So what we had to do is look at other heavy oils – there are other kinds of heavy oils, that also tend to sink more than what we call conventional crude oil – in particular fuel oils and there’s some experience with spills like that. SM: The Kalamazoo River looks so healthy to me when I encounter it. Am I being deceived? Is the fact that there are birds and frogs and plants growing around it not really an indicator of its deep health? SH: Well, in my judgment as a scientist who studied the river for years before this happened and who spends a lot of time on the river and its floodplain, I would submit that it is very healthy. And in fact the cleanup has been very successful and the ecosystem has proven to be very resilient, bouncing back after all this disturbance. Now, that said, we spent an incredible amount of money and time and effort to clean this oil up and had we not done that it could be a different story. But I think the cleanup has been very successful. And this ecosystem has come back to a very large degree. So you see the plants, you see the wildlife both beneath the water and above the water that you’d expect to see in this system. SM: I’m curious to know more about this concept of ecosystem resiliency. Are all ecosystems resilient? Would this have been a different effect in a different ecosystem? SH: It certainly could be. And one reason that the river and its floodplain is resilient, we think as ecologists that study this is that it’s subject to flooding and episodic kind of disturbances. You’ll get a huge flood occasionally that scours the river bottom. The floodplain itself is normally dry or well, it can be wet soils but there’s not surface water, and then occasionally you could have a couple feet of water there. So anything that’s there has to be able to tolerate that kind of change. Also in the cleanup, a large amount of vegetation was oiled and removed. But it was clipped off at the soil surface. So the roots remained and the plants – those plants largely came back in the next year. SM: I was going to ask you what kinds of experiments were being carried out to study the effects of the oil spill. But you say in fact, there’s not a lot of that kind of research going on? SH: There’s some monitoring by the state agencies, and that’s kind of along the lines of what they’ve done in the past as well. So they’re checking on the fish populations, they look at the insects and other invertebrates that live on the bottom of the river, occasionally. And that monitoring actually shows that things have come back to normal as far as we can tell. So we don’t have really detailed research into specific populations – and long-lived animals are – would be the particular concern. Things that were around when the oil went down the river with its most toxic composition – that’s actually more of a concern that what remains in the river today, which is probably actually the least biologically available fraction. SH: The Exxon Valdez oil spill and now the Deepwater Horizon have shown lingering effects of exposure to oil, that can last for years – surprisingly subtle though. And it took a lot of research to reveal these. Now the reason that that research was conducted in those places and we’re not seeing it in the Kalamazoo River is because we had economically important fish and shellfish populations and sometimes in the case of Alaskan indigenous people that use those resources and so on and so, we’re just not seeing the same degree of attention, the same spotlight being put on the Kalamazoo River. It doesn’t meant that things aren’t happening. It doesn’t mean that certain species and populations might be impact and might have even chronic long-term health effects in long-lived wildlife that was exposed to the oil. SM: Do you see it as a concern that that kind of research isn’t being done? SH: Well, look, I’m a scientist, we always say we want more research, right? But it’s a missed opportunity, let’s put it that way. Because these oil spills will occur in the future. By all indications we’ll continue to tap into these – this type of oil, and it’s fundamentally different in some ways than conventional crude oil. And so we need to learn about it. SM: If you were able to do all the research you wanted, what kinds of experiments or monitoring would you set up to say, maybe detect if there are some of those long-term effects from being exposed to oil? SH: Well – and this is hard for people to accept, but I think we need to set up experimental oil additions in different kinds of ecosystems that are walled off somehow – and so, a controlled way, and study the impacts, the immediate impacts and the long-term impacts. That would be a wise investment. And also we could study how to recover the oil when it’s first spilled into the environment. We almost never do that. The Environmental Protection Agency division that responded to this is their emergency response division. They’re not in the business of doing fundamental research. But in terms of the science, from our understanding of what knowledge is out there that’s the kind of thing we need. if we know that particular settings are more sensitive, things like that. SM: But in order to do that, you would need a little spot somewhere with some water and some plants and some animals and put some oil in there and figure out what happens? SH: Well, I suppose you could say that. The studies that we have now are in remarkably artificial systems. So they’ll build a stainless steel tank and put some sand in it and some seawater and then dump a bucket of oil in and slosh it around, at best. And that’s not the same as a real ecosystem and the way oil behaves, right? And that’s why you’ll see disagreement in the media and so on about whether this oil even sinks. Because in fact when you dump it into pure fresh water it doesn’t sink. But in water with natural particles, say clay or silt or fragments of leaves and organic matter, the oil adheres to that and sinks. And so we know beyond a shadow of a doubt that it sank in the Kalamazoo River system. But you’ll still hear people – often they’re working for interests that, you know, want the story to come out a certain way – that insist that this oil doesn’t sink and they might dump it in an aquarium in front of some reporters and – ‘look, it doesn’t sink, right?’ But that’s not the reality of nature. SM: Do you have an aquarium here with some water with sediment in it where you can chuck some oil in and we can watch and see what it does? SH: It’s pretty hard to get a sample of this oil, actually. I worked a long time to get a little tiny bottle. So, no. Don’t have the oil. SM: We’ll just have to proceed based on what we know about the actual spill. I read that when you’ve got this heavy tar sands oil that sinks to the bottom, that sticks to things, that you have to throw away the rocks that it sticks to, that you can’t just scrub them off. Is that true? SH: Unfortunately that did prove to be the case. It was easier to replace materials than to clean them. Looking at the Kalamazoo River you had trees, sometimes in parks and so on that you really wanted to clean, you had built structures, you had concrete riprap in some places, bridge abutments – all those proved very difficult. Now I will say that the Environmental Protection Agency didn’t liberate the use of any chemicals to clean that, and that’s one reason why it was so hard. But just hot water sprayed on the oil wasn’t enough. That didn’t take it off. SH: That’s correct and now, nearly six years later you can find oil rings on trees along the river that never come off, during all this time. And we collected some samples of that this past summer and I sent them to a lab that does sophisticated chemical analyses and they found almost no chemical changes in that oil. It’s basically the same as the original bitumen, it’s called, that’s mined up in Canada – sat on the trees out in the sun, summer and winter. Floods and droughts, you know and basically didn’t decompose. So this oil is very recalcitrant in the environment. SM: Do you still see oil sheens on the Kalamazoo River? SH: It’s really hard to find oil sheens right now. I know, because I was heading out to sample some last summer and I could only find a few, so – and the same report comes from the sheen monitoring program that Enbridge and the Environmental Protection Agency and the Department of Environmental Quality have set up. There was very little sheening last summer, which is good news. That was a big unknown, how long that would continue and that is in fact the big problem with submerged oil. Even if it were nontoxic, if you knew it was nontoxic, the fact that it comes to the surface so readily was a major motivation to keep going after it. SM: As we said, we’re five and a half years out from the spill, we’re coming up on a couple of years after most of the cleanup wrapped up, there’s not tons and tons of research happening on the long-term effects of this oil spill. This summer for example, what’s going on with the aftermath of the spill. There’s a little bit of monitoring? I understand maybe some of the settlements are still being settled? SH: With respect to monitoring, the Department of Environmental Quality is in charge of this now, and their staff are carefully going over, mile by mile, the entire nearly 40 miles of affected river and floodplain and making sure it’s cleaned up to standards that satisfy the state. And if not, they will ask for some more probably minor surgical interventions to do further cleanup. But so far it’s been looking pretty good. And so that process will continue. With respect to the settlements, we had the settlement with the state, that was widely reported – as $75 million. And we had some more settlement with this natural resources damage assessment process. But we’re still awaiting a settlement from the federal government under the Clean Water Act which could be a sizable settlement. And it’s been delayed and delayed. So presumably there’s some complex negotiations going on somewhere. State officials say that the 2010 oil spill in the Kalamazoo River likely won’t lead to long-term problems for residents who breathed in oil-related chemicals. The Michigan Department of Health and Human Services today released its final report on potential health problems from chemicals from the spill in the air. Five years after an Enbridge Energy oil pipeline ruptured near Marshall and caused the largest inland oil spill in the US to date, the head of a group that pushes for tighter rules on pipelines says the law does not yet reflect lessons learned from that spill. (MPRN-Undated) The National Wildlife Federation says it’s making plans to sue the federal government. The environmental group says the US Department of Transportation is not enforcing a law that requires “worst-case” disaster plans for underwater pipelines to be on file.